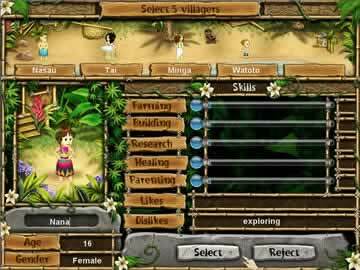 Virtual Villagers: The Tree of Life Game Review - Download and Play Free Version! Village life goes on, even when you're not playing. Lots of villagers to unlock and mysteries to solve. Difficulty settings and game speed let you adjust the game to your style. Immersive theme makes you feel for your characters. You spend most of your time watching the villagers. Save the Dying Island Before it Kills the Village! The beautiful island, Isola, is dying! Help five villagers embark on a quest to find out why. Can you build a new village and unravel the secrets of the island to save the withered Tree of Life? In this simulation game, begin by choosing five people to join your tribe by weighing the advantages of age, skills and more. Then start your village! Allocate tribe members to gather food, build huts, research, care for children and more. Discover countless mysteries, from a strange mausoleum to helpful herbs to collectibles. While you wait for tribe members to perform tasks, explore with the children in your tribe because they're the ones that can collect objects. This game even continues in real time whether or not you have the program open! An Addicting Game With Countless Hours of Play! With so many mysteries to unlock and ways to improve your village, this game offers countless hours of fun! Try to earn all 80 medals, from easy ones like getting two villagers to mate to tough medals like collecting 1,000,000 units of food. This game is a great way to put your strategy skills to work to create a thriving village and save the Tree of Life! 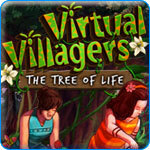 For an adventure that offers countless hours of fun play Virtual Villagers 4: The Tree of Life now! In Virtual Villagers: Tree of Life, you get to control the lives of your villagers and their children while you investigate the mysterious failing health of the Tree of Life. You are responsible for building shelter, gathering food, researching new technology and much more. The villagers will have to learn skills to heal the tree and other mysteries in the area. All this is going in real time, even when you aren't playing. You start the game with a brief story about the tribe chief who notices that Isola is slowly dying. You are selected to pick a team and lead an expedition to discover why Isola is dying. You pick five members for your team and then start your journey. After a while you stumble onto the dying tree of life where you begin work to save it. You will need to tell your villagers to perform tasks like gather food, research and build. The longer a villager performs a task the better they get at it. The villagers will continue doing what you have told them to most of the time, but occasionally they will explore or eat. The other goal besides staying alive is exploration. There are several mysteries that you need to solve as well as things that will help your villagers out. Controlling the game is very simple and only requires the mouse. To start a villager on a certain action you hold down the left mouse button on them which will pick them up and drop them near the activity you want them to perform. Tech points and food are the only consumables in the game. Tech points are earned by scientists and can be used to upgrade things like construction, farming, science and even dendrology (this helps you save the tree). Food is gathered or grown and feeds the villagers when they are hungry. The villagers will eventually age and die so you will need to continuously replenish the population with babies. Children won't work until a certain age, but they still consume food and resources. There are several challenges to accomplish. Some of these are things you will accomplish by advancing in the game but some require you to explore and solve mysteries. The graphics are 2D and pretty out of date, but that doesn't affect the gameplay. The graphics really add to the island theme and stay true to it. The sound effects and music are great and help create an immersive effect to the game. Once you start playing you will find yourself caring about your villagers like they were real people. While this game will entertain you for a long time, you can't play it for much more than half an hour continuously without getting bored. Since you only need to tell the villagers what to do and they will keep doing it, your interaction is fairly minimal. This game is best played in small bursts and then letting things progress while you are away. Overall Virtual Villagers: Tree of Life is a great game that will entertain you for a long long time. Playing in short bursts means you won't have to spend all your time playing and having things progress while the game is off makes it interesting. Easy controls and a family friendly theme makes this game playable by anyone. With plenty of upgrades and mysteries this game is well worth the time.